Available as low as $0.94 per oz over spot! Republic Metals Corporation is one of the world’s most respected premium bullion manufacturers and dealers. Its lineup of cast bars and minted ingots is diverse, and its cast silver is one of its top sellers. 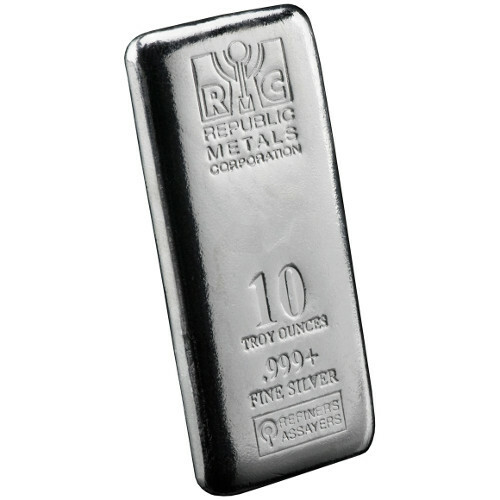 Today, the 10 oz RMC Silver Cast Bar is available to purchase in brand-new condition on Silver.com. Ships to you in plastic for individuals or sealed boxes of 25. Produced with traditional cast methods. Obverse features the only design elements. Each of the 10 oz RMC Silver Cast Bars available to you today is sold and shipped with protection in mind. Individual bars ship in heat-sealed plastic to protect against damage as well as tampering during shipping. For multiples of 25, RMC ships the items in a sealed box. Silver cast bars are immensely popular with those investors who aren’t interested in spending a fortune on precious metals. Cast silver bars come with much lower premiums over the spot price of silver because the production methods are much less complex than minted ingots. To produce products such as the 10 oz RMC Silver Cast Bar, refineries melt silver in large cauldrons and pour it (sometimes manually) into large molds that fit the shape of the desired end product while delivering the proper weight and metal content. The bars are then dropped in water to cool or left exposed to air in the molds to cool. The obverse of the 10 oz RMC Silver Cast Bar has the engraving of the RMC logo at the top, followed by the company’s full name below it. Toward the bottom of the bar you’ll find the weight, purity, and metal content of the bar along with an assayer’s mark. The reverse side of each bar is intentionally left blank. Republic Metals Corporation is a private minting facility located in the United States. Founded in Florida in 1980 by Richard Rubin, RMC started with just a small investment of $2,500. Now headquartered out of Miami, Florida, RMC operates a 150,000 square foot facility in which it produces an annual silver and gold output of 7,000 tons. 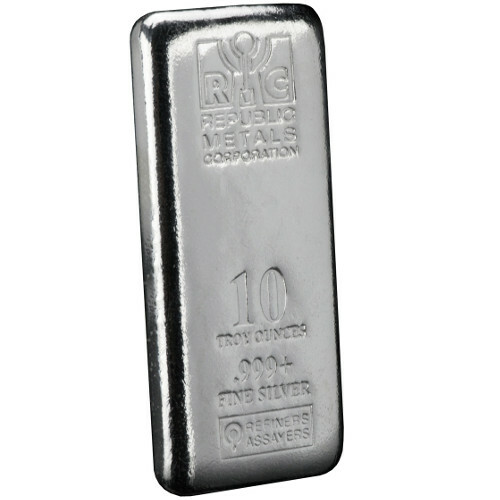 Please don’t hesitate to reach out to Silver.com with any questions regarding the 10 oz RMC Silver Cast Bar. Our customer service team is available on the phone at 888-989-7223, online using our live web chat feature, or via our email address.